The article says routes 33, 209, 283, 419 and 485 bus services will all terminate before the bridge. Presumably the 72 will be diverted? What's the bets that something is found that prevents a reopening after these 9 days? Interesting that the substantive work has gone backwards about 3 years in the space of 18 months. The 509 should make a reappearance then, also should be a 24/7 service. Well maybe becuase of this LU will treat us to a double decker working on the 33, albeit without blinds. Putney will be gridlocked though. Just been on TFL website, status updates page, entered 15 Feb on the future dates tab and tried 33, 72 etc. Status is Green with words No planned disruptions. Clearly disjointed TfL havent realised the bridge is closed, or prefer not to let the public and its customers know. My guess if 9 days has been planned to coincide with school half term, then there is no excuse for lack of info, as not like an unexpected event where it takes time to change info. Deckers have worked now and again between Fulwell & Barnes when the bridge is open. 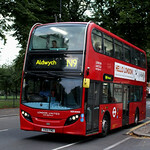 Didn't the N22 do that routing? I'm not sure - didn't that use Putney Bridge and then run along Putney Common to Barnes rather than use Hammersmith Bridge? Thanks snowman for sharing this. TfL were never planning to use decks on the 72 until that bridge was fixed, that's all the tender award taught me. But for whatever reason, politics got involved and a lot of sitting on hands situations happening from all stakeholders involved; possibly until extra revenue could be found as, I'd safely guess departments wholly underestimated the extent of restoration work required. Well, they only really did one rounder and VA71 only made it to Richmond back in 2013. SP40089 managed to get to Barnes, but dead ran back. Most DD workings acted as meal relief busses. So no 509 this time, we must make do with the 72. 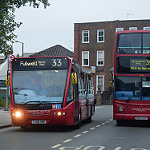 Hopefully the short turning buses will all be running through to Hammersmith Broadway at least. 72 - diverts via Chiswick Bridge seem to do well, and the buses do pick up at Chiswick, so the quickest way for me to Hammersmith is via 72, weirdly!